I am back from my short vacation rejuvenated and am ready to take up new challenges. I thank all my readers who had left a comment and I should hopefully reply back to all in a day or two. While my trip was good, I had a horrendous time while coming back and have not yet recuperated from the turmoil Air India put us through. I will save that for my next post. Two weeks of sitting at home and having good homemade food has made me lazy and when I opened my fridge on Tuesday, I was at a loss for culinary inspiration! I had cleaned out my fridge before leaving and there was no butter or jam or any other spread to be had with bread. When stuck with a situation like this, my normal reflex is to make egg omelets, but I had cleared out eggs too. You might be thinking ‘ Get up and go to the store, girl’. Well, while that option was pretty much available, as I said we were yet to recover from the tiring journey and driving seemed a mammoth task and making something at home seemed smaller effortwise! So, this time it was peanut butter. Yes, I make peanut butter at home. It’s the easiest recipes I have ever come across and I find making it at home very sensible than keeping a jarful of store bought butter lying around untouched for a year, because I have very few takers for it. When I made my first batch with a cup of peanuts, it lasted for over a month and I love the flexibility because I can make it fresh whenever I need it. The recipe is child’s play as I had mentioned. Roast peanuts as you would do for chutney, on a low flame, till light brown. Let it cool. Grind in a food processor adding absolutely no water. Add a teaspoon or two of oil, along with a pinch of salt. You can add a pinch of sugar too, if you like. Stop the processor when the peanut butter has reached the consistency you desire, be it chunky or silky smooth. You can add a little bit more oil, if you want the butter to spread easily. Butters can be made with almost all nuts and the process remains the same. Try cashewnut butter, almond butter or try mixing nuts. You can experiment with adding seasonings like chilli powder, black pepper or anything which catches your fancy. Just like my flavored butter post, the sky is the limit when it comes to variations! I had been wanting to make pies for a very very long time. A couple of years I should say. Though a lot of our fellow foodies baked mouth watering pies and tempted me into the verge of trying them out, I used to shy away at the last moment. Pies seemed too complicated. 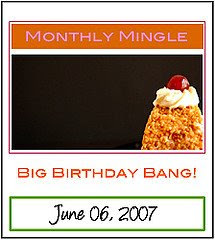 Then, Meeta announced MM-Big Birthday Bang and I had to make something for this lovely lady who has such a passion for photography and shares her wonderful talent with the rest of the world. You might be wondering about this last minute rush. But my days have been packed with activity lately, as I am leaving to India on a short trip for my sister’s wedding. 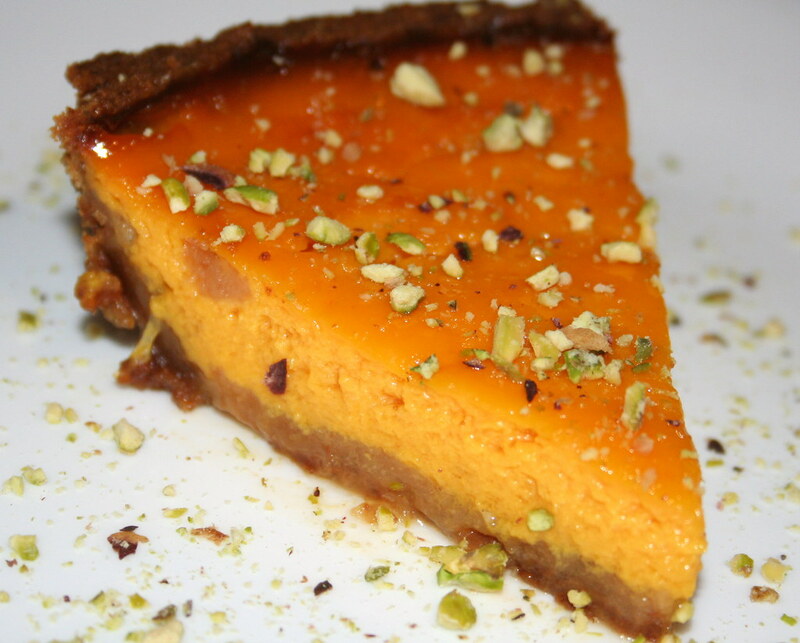 Yet, I couldn’t contain myself from wishing Meeta and here I come with a Mango Pie to the party. I finally conquered my fear about baking pies! 🙂 It’s a simple no fuss recipe. I found the recipe for the graham cracker pie crust from the Internet and modified Paula Deen’s sweet potato pie recipe. Crush the crackers to a coarse mix. Add sugar and mix together. Melt butter and add it to the cracker and sugar mixture. Knead with hand to form a rough dough. Press into a 9 inch pie pan. Mix everything together till well blended. Pour into the graham crust lined pie pan. Bake in an oven preheated to 350 degree Fahrenhiet for 1hr 15 mins or till a knife inserted in the center comes out clean. 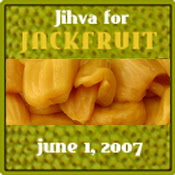 This month’s JFI theme chosen by charming couple Bee & Jai is Jackfruit. The gentle giant of the fruit kingdom with its enticing aroma and sweet scrumptious pods is all set to entrance us in a variety of mouth watering recipes in JFI array, thanks to Indira. The jackfruit tree itself creates ample interest in the way the fruits are borne on the trunk. Like pearls hidden inside the silky bed of an oyster, the firm, succulent pod is hidden inside a rough and tough outer green rind followed by yellowish sticky appendages which hold the pods in place. Cutting a jackfruit itself is an art. The fruit has to be carefully cut in layers so as to extract the pods intact. To avoid the stickiness of the interiors while cutting, oil is used as a lubricant on hands. My aunt Tulasi is the only one in the family who can cut a jackfruit perfectly. It was always fun to watch her cut the fruit and hand the pods over to our eager hands….We would gobble them up and keep asking for more…The seeds are another delicacy, when roasted over an open fire. Sometimes, they find their way into curries too..That I will save for another post. For JFI, as usual I wanted to try something new and born was the idea of muffins. I might have come up with a better idea had I had access to fresh fruit, but I could only get canned fruit. My hubby is a fan of muffins and I beg to differ. I always sense an eggy odor in muffins which puts me off. So, this was an experiment to make a muffin which is egg-smell free and ofcourse hubby dear would be happy too! 🙂 Onto the recipe now..
Makes about 20 medium sized muffins. For the jackfruit pulp, roughly mash canned or fresh fruit. Whisk together egg, milk, oil, honey and vanilla extract, till well blended. Add the jackfruit pulp to the egg mixture and mix well. Sift together flour, baking powder, sugar and salt. Add the egg and jackfruit mixture to the flour and mix only till the dry ingredients are moistened. Do not overmix. Immediately fill muffin pans or muffin cup liners, till they are 1/2 or 2/3 full. Bake in an oven preheated to 375 degree Fahrenheit, for about 20 to 23 mins or until a toothpick inserted in the middle comes out clean. Let cool for sometime. 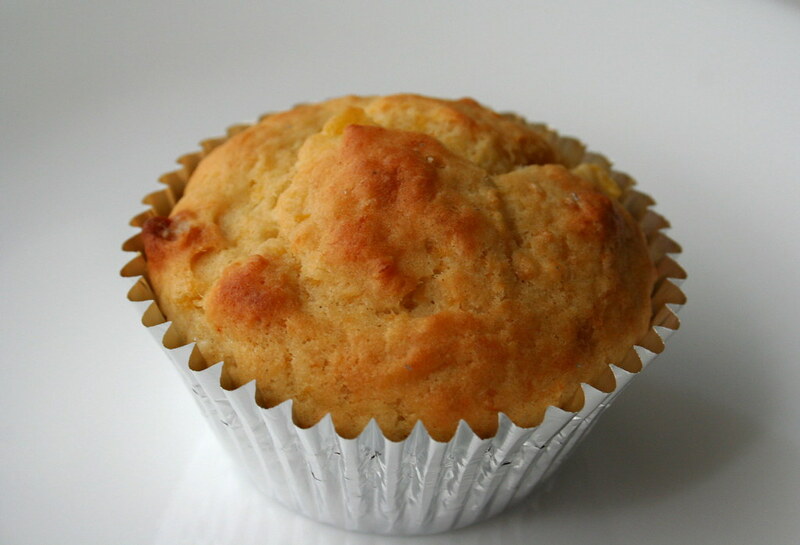 According to JoyOfBaking website, american muffins are supposed to have a symmetrical domed top, with a bumpy surface. They should feel light for their size and when cut in half the interior should be moist and tender with no tunnels. I feel proud to say that my muffins turned out perfectly well! Like a perfect American muffin! Please note that this recipe produces mildly sweet muffins. 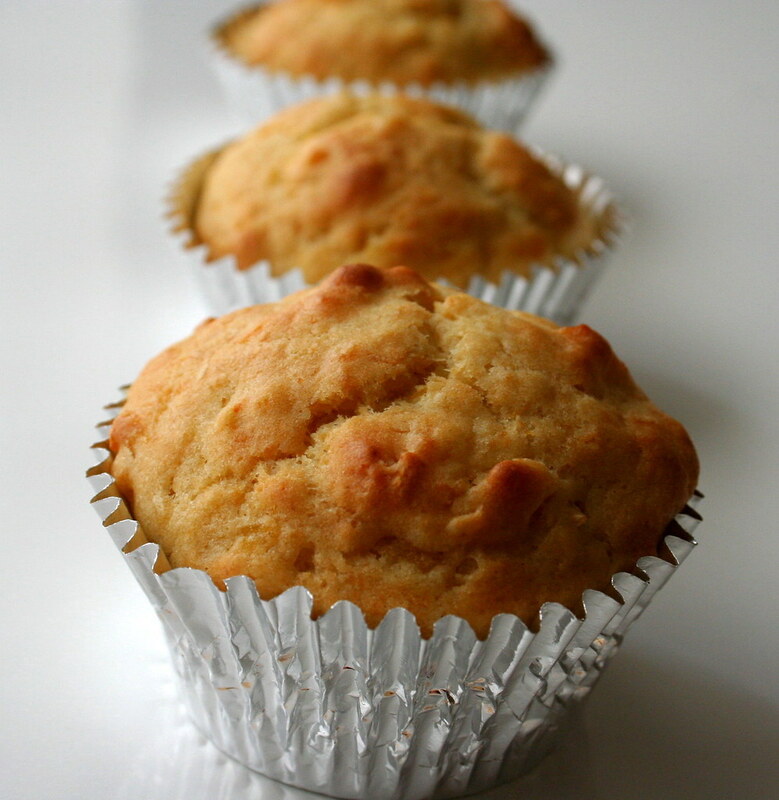 If you need sweeter ones, use a simple sugar glaze on top or sprinkle a little sugar while the muffins are hot.